Check out The Amazing Spider-Man 2 concept art by Scott Lukowski! 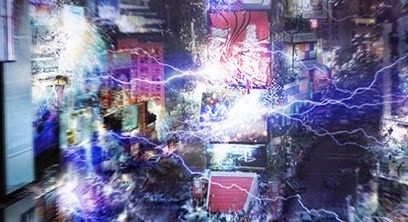 The Amazing Spider-Man sequel opens last week and one of the big set pieces in the film is Electro's attack on Times Square. The amazing thing about the set is that it was built to scale on a parking lot in Long Island. It looks stunning in the film, and it was stunning to the actors as well. "It was wild," says Andrew Garfield, who plays Spider-Man. "When we drove up the first night, I was awestruck. From a distance, it looked like a football stadium -- the size of it and the way it was lit." Jamie Foxx, who plays Electro said it was "built to scale." He added, "Not all of it. but that part where the red stands are? That's all to scale. I saw it and I was like, 'What the [expletive]? This is amazing!' The shops, the buildings, the street, the everything. It was just crazy." One of the artists that helped create the look of the scene was concept artist Scott Lukowski. Scott Lukowski is a professional concept artist who's worked on big budget films like Transformers (2007), Transcendence (2014) and Alice In Wonderland (2010). Here's what he said about working on the film. "I was given a call during the infant stage of the Amazing Spider-Man 2," said Scott, "This was before the project was greenlit. At this time initial concepts were developed to assist the approval of the story before pre-production could begin. "The task I was given had to do with the Times Square sequence where Electro unleashes his power and ultimately knocks out the Square. Multiple versions were created of the overview illustration in order to play with varying levels of devastation, mayhem and the likes. I wish I could have continued with other aspects of the film but there was a short window for me to work within due to prior obligations on another project. Regardless, this was great experience." Click on the links if you want to see more of Scott Lukowski's work or The Amazing Spider-Man 2 on my blog. What do you think of the concept art? If you've seen The Amazing Spider-Man 2 what did you think? "We’ve always known that Spider-Man’s most important battle has been within himself: the struggle between the ordinary obligations of Peter Parker and the extraordinary responsibilities of Spider-Man. But in The Amazing Spider-Man 2, Peter Parker finds that a greater conflict lies ahead. It’s great to be Spider-Man (Andrew Garfield). For Peter Parker, there’s no feeling quite like swinging between skyscrapers, embracing being the hero, and spending time with Gwen (Emma Stone). But being Spider-Man comes at a price: only Spider-Man can protect his fellow New Yorkers from the formidable villains that threaten the city. With the emergence of Electro (Jamie Foxx), Peter must confront a foe far more powerful than he. And as his old friend, Harry Osborn (Dane DeHaan), returns, Peter comes to realize that all of his enemies have one thing in common: OsCorp." Sweet! Thanks for sharing these, Maurice.